GUYS AND DOLLS, a landmark in American music theatre, was first produced in New York in 1950 when it ran for 1200 performances. Many critics thought it not only the best musical of the season but also the best play. It came to the London Coliseum in 1953. Laurence Olivier always wanted to stage Guys and Dolls at The National; and indeed he was on the point of playing Nathan Detroit in 1970 when he fell ill and the whole production had to be indefinitely postponed. Richard Eyre’s production opened at The Olivier in 1982 and was one of The National’s biggest successes. 14 years later the same production was revived and was a huge success all over again. Guys and Dolls has first-rate songs by Frank Loesser and a first -rate book by Jo Swerling and Abe Burrows. The script, sentimental and witty, is based on Damon Runyon’s The Idyll of Miss Sarah Brown and the characters of Runyon’s short stories. The tales are satires on the low life of petty crooks in and around Broadway. The bums, broads, touts, pickpockets, showgirls, gangsters (many based on real­-life gangsters whom Runyon knew personally) are immortalised by their whimsical nicknames and idiosyncratic language. They are all gamblers and one of the high spots of the show is the choreographed crap game in the sewers. Nathan Detroit (David Haigh) runs the oldest established floating crap game in New York. In order to raise cash to book a venue, he bets Sky Masterson (Jamie Parker) that he can’t seduce a salvation army missionary (Siubhan Harrison). Sky, who is called Sky because he is willing to bet all he has (and you can’t go higher than that), manages to persuade her to come and have dinner with him in Havana by promising to bring a dozen genuine sinners to her Save-A-Soul Mission. Jamie Parker’s Sky is a charmer especially when he is singing “I’ve Never Been in Love Before”. David Haigh acts in his familiar comic self-disparaging manner which is always very disarming. 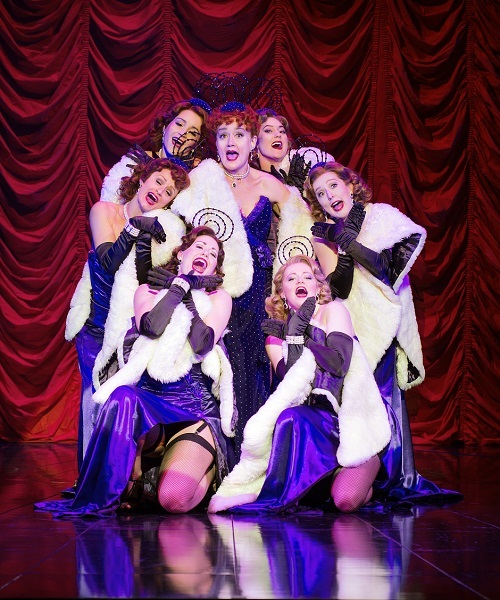 Sophie Thompson as his long term fiancée has all the best one-liners and is very funny in a broad caricature way and her “Take Back Your Mink” cabaret number is given a broad caricature striptease treatment. “Sit Down, You’re Rockin’ the Boat” has been stopping the show ever since Stubby Kaye (in the role of Nicely-Nicely Johnson) first sang it at the premiere in 1950. It is one of the great Broadway show-stoppers and has fully rehearsed encores already been built in! 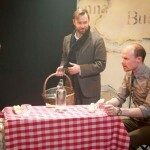 Gavin Spokes’s Nicely-Nicely Johnson is the most Runyonesque character on the Savoy stage. 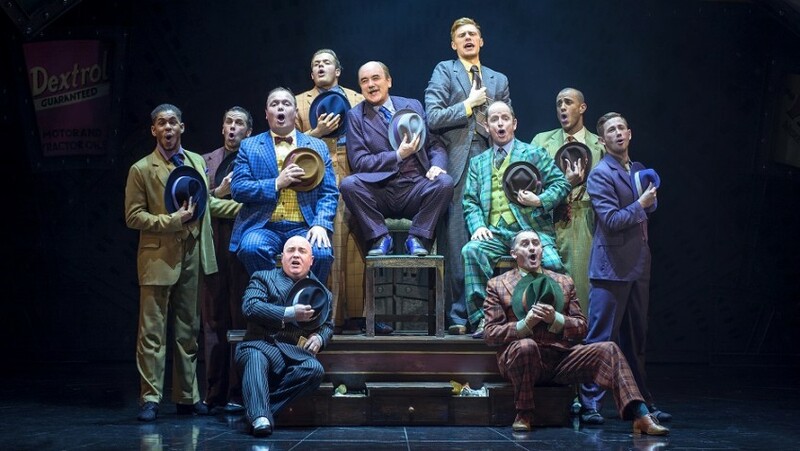 Greenberg’s lively and enjoyable production, first seen at Chichester in 2014, will be going on a long tour of the UK starting in mid-March, following its London run.